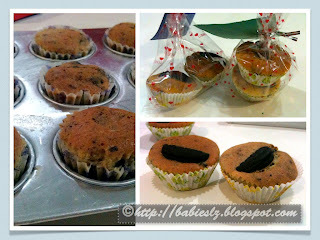 In the boxes: Nutella (L) & peanut butter (Z) sandwiches, fish biscuits and longan. This is another set of bread mold that I never used since I bought it more than a year ago. I also have a set of sushi maker which is somewhere in the kitchen. I seriously need to start using these stuffs before they become antique. Hehe... Yes, I will! 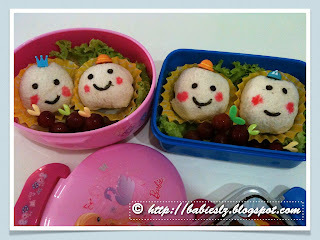 If I remember the next time I prepare bento! 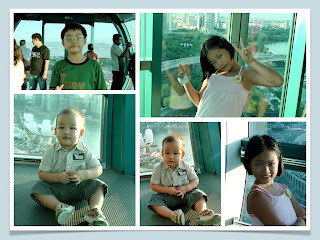 Finally we fulfilled our kids' wish - Singapore Flyer! It took us such a long time... When u make plans, things often don't turn out the way you want it. Little Beanie didn't bother about the view. He was more interested in snacks! 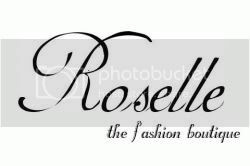 My 2 long time & good (best) friends.. In the boxes: Steamed broccoli, stir fry pork, grapes, rice, chocolate. 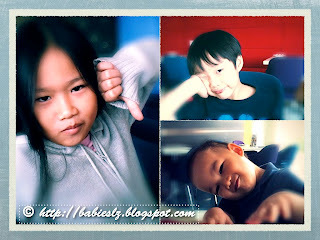 This was the 'best' pic of my kids for this month. Really tough taking a nice pic of them... 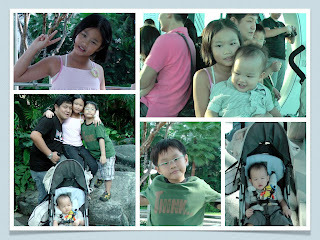 Nevertheless, they are the most adorable ones! I'm very happy with my little Beanie, what he is able to do so far! Almost everyday, I see him picking up new words or new motor skills and not easy for me to keep track of everything! I love to see him smile! Like what my gal said, how to get angry with him when he smiles like that? ♥ He knows how to turn on & off the TV on his own. Whenever he wants to watch TV, he tells me "BOB" and sought of like ask for my permission to turn it on. That means I can spend a little more time on my chores. 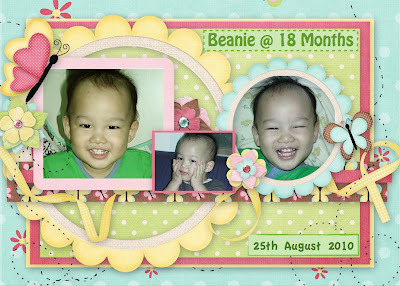 ♥ FIRST time told me he pooed in his diaper on 4th August! Since then, he will tell me whenever he poo! 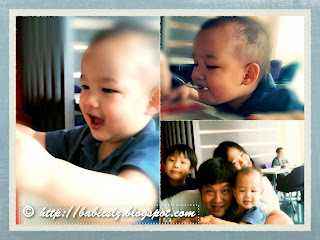 ♥ He is able to pee in the toilet most of the time before shower. Will take a step at a time, don't want to rush into toilet-training him. 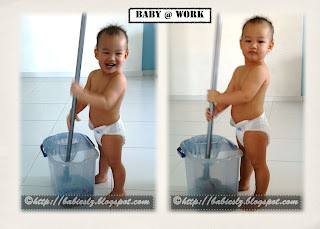 ♥ He used to only use the magic clean to help me clean up the house, now, see what he does! He tries to 'mop' the floor! ♥ He loves music or musical instruments! He plays with harmonica, recorder (jiejie's) and piano. He dances whenever he hears music! ♥ Another habit of his is that he MUST buckle the belt of his chair once he comes down from it. 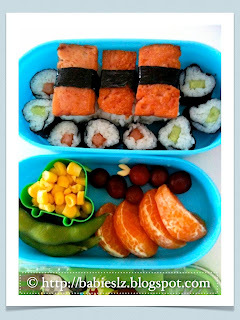 In the boxes: Sushi, corn, oranges, edamame & grapes. 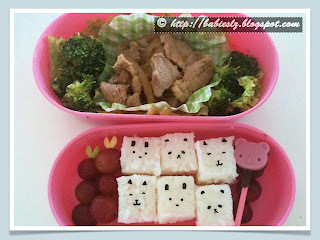 Can you guess whose bento is this? Hehe... It is none other than my 老二! In the boxes: Bread with pork floss fillings & grapes. 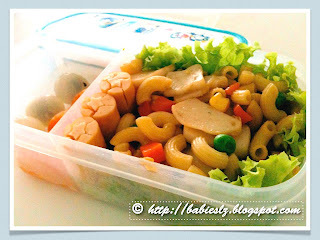 In the box: Stir fry macaroni, sausages, longan & oranges. 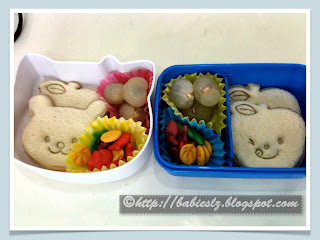 Mommy was too lazy to come up with something nicer so just a simple bento for him. Cooking macaroni never goes wrong, my kids love it. 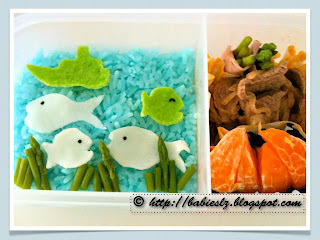 In the box: Colored rice, asparagus, Stir fry beef with onion, asparagus bacon roll & oranges. 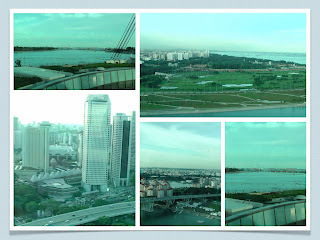 Well, at least my dear boy think it's nice. 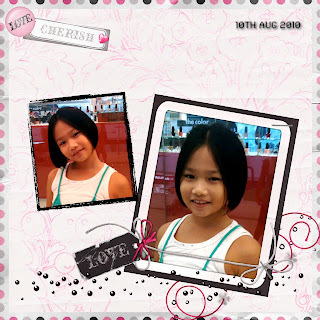 I decided to cut my girl's hair short, it is easier for her to maintain it. And now, look at her. She's HAPPY! She will probably ask to grow her hair long again... She will, once she knows how to take good care of her hair. I think my girl is very happy to join the rest of us (except Beanie). She will regret it once she knows how inconvenient it is when you are doing sports. 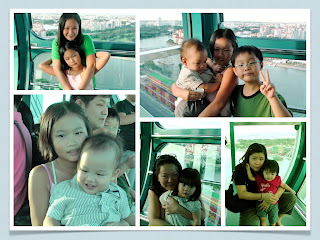 My life is soooo WONDERFUL with them! 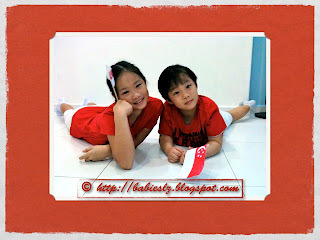 LZ was told to wear red top & white bottom for National Day celebration in school. 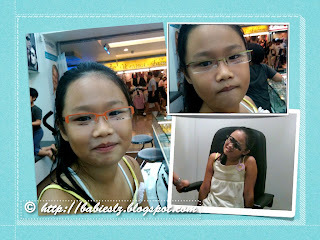 They have outgrown what they wore last year so we had to look for clothes for them at a last mins. 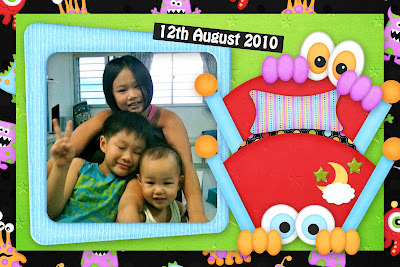 Of coz they can also wear uniforms but my kids insisted on wearing red & white. So patriotic right?